Two Indians Talking will close the new Vancouver Indigenous Media Arts Festival (VIMAF), hosted by W2 Community Media Arts Society, November 10-13, 2011 at the historical Woodwards Building in conjunction with Simon Fraser University (SFU) and the National Film Board (NFB). We’re delighted to be included in the lineup of this vibrant new multi-theatre, digital storytelling and live presentation forum that includes performances and panels for all people to celebrate and enjoy Indigenous culture. 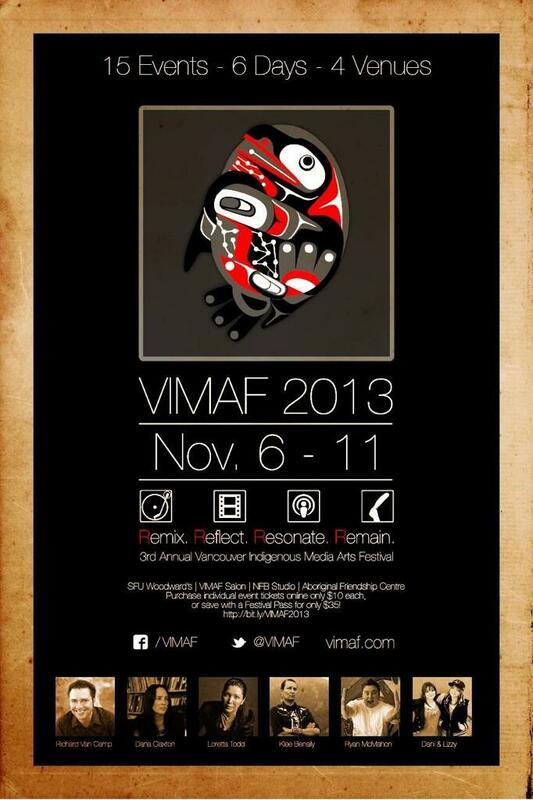 Two Indians Talking screens on Sunday November 13th, at 7:00 pm in the W2 Media Cafe as part of the closing ceremonies. Tickets are $10. Further information is available at vimaf.com. Festival passes and Gala tickets are available in advance through eventbrite.